Our love of trekking goes back to 2006 when we undertook our first long-ish hike overseas. We spent four weeks travelling through Peru and Bolivia, and as part of that we had intended to do the Inca Trail from Cusco to Machu Picchu in Peru. We were pretty excited about the notion of hiking to Inti Punku (The Gateway to the Sun) and watching the sunrise over Machu Picchu before heading down to explore. This trip was the first time we had planned to ‘wing it’. We had booked accommodation for the first two nights and the last two nights. 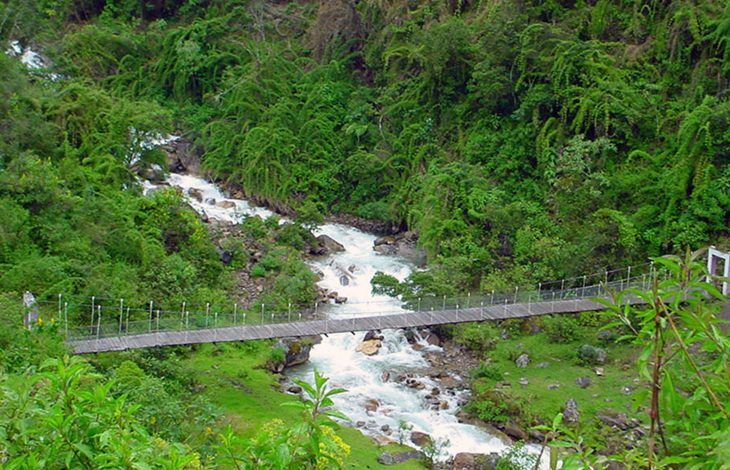 We got as far as Auckland when we heard that the Inca Trail treks were all booked out…. hmmm that really is winging it! We had not planned to head straight from Lima to Cusco – we were intending to meander our way to Cusco (elevation 3,300 metres) to assist in acclimatising to the altitude. For those of us living in Australia, acclimatising to altitude is difficult – our highest mountain is Mt Kosciusko and only 2,228 metres so already we were well above that! But we didn’t want to miss out so there we were at elevation with little opportunity to acclimatise looking for a trekking company with spaces on the Inca Trail tours. And then we heard there had been a land slide near the Inti Punku and access to Machu Picchu along the Inca Trail was no longer possible. So what to do? We had heard about the Salkantay Trek that runs from Mollepata to Salkantay Mountain through to Aguas Calientes and then to Machu Picchu. The hiking company we settled on just happened to have some vacant spots so there we were on the Salkantay Trek. Looking back, we are so glad we did. It was fabulous and much less of ‘a tourist trek’ than the Inca Trail would have been. First day was an early bus trip to Mollepata (2,900 metres) where we had breakfast before heading to Soraypampa (3,900m). The bust trip was hilarious – full of locals and lots of colour! We kept hearing a dog barking as we drove along and then it dawned on us…. the dog was in the luggage compartment. What a challenge that was for our well-educated middle-class western sensibilities! The views of the Salkantay Mountain (6,270 metres) from Soraypampa are spectacular! I have to confess that despite the beauty of my surrounds, I struggled on the first few days with the increasing altitude. I thought my head was going to implode. Really. This was my first experience with altitude sickness and I was not very happy. The next day we head from Soraypampa through the Salkantay Pass (4,638 metres) to Chaullay. I am still not feeling fantastic. Tim has a photo of me on this day – I am sitting in the tent lacing my boots, rugged up with my beanie pulled down low on my head…I am really not happy! So with a big climb ahead what do you do? Well I paid US$50 for a horse to carry me up to the Pass. Suddenly I am looking happier! Poor Tim did the climb on foot. Of course I will never hear the end of that! Once over the Pass and still enjoying the stunning views of the snow-capped peaks, we started to meander our way to Wayracmachay (3,800 metres) for lunch before following the Salkantay River. The vegetation starts to change rapidly from alpine heath to begonias and orchids. We took some great photos much to the concern of our tour guide who kept moving us on ….it was so beautiful we wanted to ‘stop and smell the flowers’ and so we did! The next day we headed to Santa Teresa along the Santa Teresa River Valley. Again more stunning flowers, birds and butterflies. We have lunch at La Playa before the bus trip to Santa Teresa where we visited the hot springs, which were a welcome opportunity to wash off some dirt. Just make sure you don’t get stuck in the mud like I did…I was knee deep and starting to wonder how I would get free. From Santa Teresa we crossed the river in a small cable car powered by hand and then on to a flatbed truck to the Hydroelectric Power Station near Aguas Calientes where we had lunch and transferred the larger bags carried by the porters on to the train. We spent a couple of hours walking along the railway tracks into Aguas Calientes. All along the way we got tantalising glimpses of Machu Picchu. All rested from our overnight in Aguas Calientes, we rose early the next day to see the sunrise from Machu Picchu (2,430 metres). That means a 4:30 am start, climbing up huge steps in a hurry and in the dark. Looking back, we should have paid the US$12 for the mini bus! For some reason we decided to stick with the tour group, some of whom were, to put it simply, just cheap! There we were…Machu Picchu in all its mind blowing glory. The only word that I could use at the time was WOW! Machu Picchu is a 15th-century Inca citadel situated on a mountain ridge. 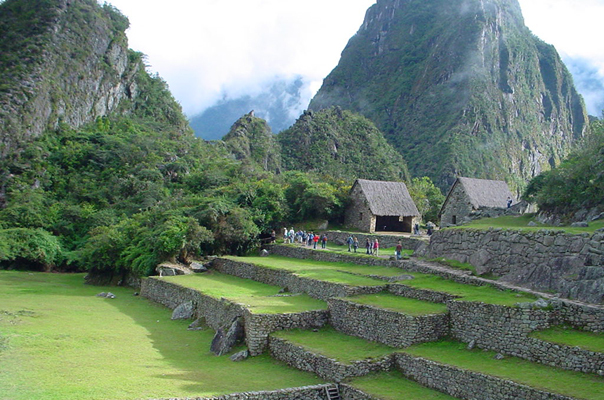 It is thought that Machu Picchu was built around 1450 as an estate for the Inca emperor Parchacuti (1438–1472). The estate was abandoned in the Spanish Conquest in the mid-1500s. We spent hours and hours at Machu Picchu. You can feel the intensity of the site. It is truly awe inspiring despite overcrowding. And I would have been happier if peoples’ mobile phones had not worked so well…. I lost count of the number of people asking loudly into their mobiles ‘Guess where I am?’….. The next day we boarded the train from Aguas Calientes to Ollantaytambo and back to Cusco by bus. Every time we do a trip it becomes the ‘most difficult and challenging we have done’. 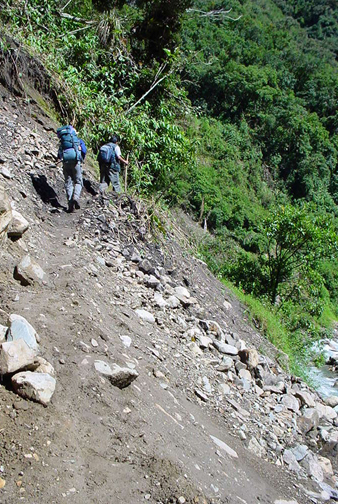 The Salkantay Trek, in 2006, was just that. It has since been eclipsed by a few other crazy things we’ve achieved but at the time, Salkantay was the toughest. And why? Definitely the quick change in elevation but there was more. We thought we were reasonably fit but not nearly fit enough. Our gear was pretty basic…heavy, uncomfortable, bulky and for me…not warm enough. All things that were pretty easy to fix and so we have.